Everyone keeps score, whether we admit it or not. The day we turn thirty-one, we become contemporaries with everyone who has ever been thirty-one, and it becomes our business that Microsoft has just made Bill Gates an instant billionaire and Charlotte Bronte is astounding the public with Jane Eyre, Valentino is about to snuff it and so is Franz Schubert, and guess who will get the bigger funeral. 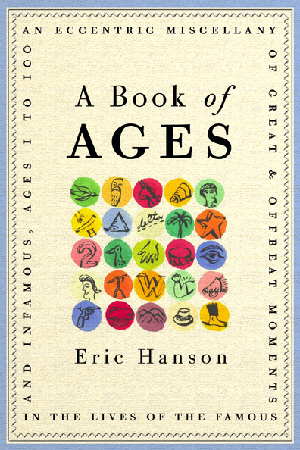 Eric Hanson’s A BOOK OF AGES is a scorecard. Drawn from the lives of minor and major celebrities, legends and one-shot wonders, politicians, scientists, and artists, A BOOK OF AGES tells you who is doing what when and who is still sitting on the sidelines. Year by year, from infancy to 100, the collection shares poisonous remarks, feuds and fallings-out, failures and rejections, bad reviews, and dead ends, as well as early masterpieces, reinventions, second chances, and lifetime achievements. A carefully edited, witty anthology of biographic details, A BOOK OF AGES is an insightful reference for literary enthusiasts, a charming almanac for trivia lovers, and a perfect gift for anyone’s birthday.